Atlanta Real Estate Forum congratulates Berkshire Hathaway New Homes Division and Marketing Results for winning a Gold OBIE in the Best Online Banner and Box Ad category for Soleil Laurel Canyon. Presented by the Atlanta Sales and Marketing Council, the OBIE Awards are the premier awards given in the Atlanta new home construction industry. Soleil Laurel Canyon is a master-planned, 55-plus community in Canton with homes priced from the mid-$200s to the $400s. Soleil offers low-maintenance homes designed for aging in place in a selection of cottage, traditional and craftsman-style homes. 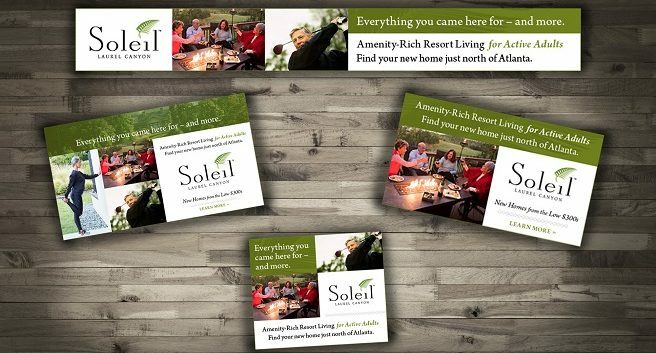 The box and banner ads for Soleil Laurel Canyon were created with strong lifestyle images to promote the Resort Lifestyle at Soleil. The 55-plus buyer is looking for activities and a great lifestyle now that they have the free time. The strong, colorful lifestyle photos relate to the target market and pull them in to the ad. The font is large, clean and easy to read. The simple copy and wording lets interested buyers know that Soleil is a 55-plus community with resort-style amenities. The box and banners ads were strategically placed to hit a large audience and also to selected geographical areas and to selected buying behavior patterns. Soleil targeted competitors geographically, master-planned communities in the area to hit the empty-nesters and luxury travelers who have the time and money to enjoy life. The box and banner ads were, and still are a huge contributor to the traffic to the community and are top generators of traffic to the website. For the month of March alone, the digital box and banner ads generated 19,559 views and 5,920 sessions to the website and the ads were the number one referrer to the Soleil website with 1,090 visits. For more information, visit www.SoleilLaurelCanyon.com or call 404-317-3808.